Montreal is a large city in the province of Quebec in Canada. Although it's not the political capital of the province, it is the cultural and economic capital and for many visitors it is the point of entry for the region. It's also the second largest city in Canada and it is a fun place to visit with a lively nightlife and interesting culture. Montreal has a handful of great hostels. Most are located downtown and they offer backpackers and budget travelers a fun and affordable place to stay in the heart of the city. If you're hoping to meet other travelers, then a hostel is likely your best option. How much do hostels in Montreal cost? A good hostel for backpackers, solo travellers, female travellers, couples, and small groups. Montreal Central is part of the Samesun chain of hostels in Canada. It's a high quality hostel in one of the best locations in downtown Montreal. It's within walking distance to all kinds of attractions and it is regularly and award winning facility. Montreal Central is also near some of the best shopping, nightlife, and dining options in the city. Public transportation is also close by. This hostel has a social atmosphere and friendly vibe where it's easy to meet other guests. They host all kinds of activities for guests and there are walking tours and evening events that keep the place social and fun. Hikes, game nights, bar crawls, and city tours all help guests enjoy the city while getting to know other travelers. The staff is wonderful and they know the city well so they can answer any questions you might have. Samesun Montreal Central has all kinds of amenities available for guests. There is a complimentary breakfast served every morning, free wi-fi throughout, and several good common areas where guests can hang out. The facilities are clean and modern and there are thirty rooms in total that include both private rooms and dorms. Dorms sleep four, six, or eight people and guests have a reading light, power outlet, and security lockers. There is also air conditioning and refrigerators in every room. Twin and double private room are also available. A good hostel for solo travellers, backpackers, and small groups. Auberge L'Apero is a located in the middle of downtown Montreal. It's just a five minute walk from two different metro stations and it is within walking distance of many different restaurants, shops, and attractions. It's a safe, clean, and comfortable place to stay where you can enjoy everything that the city has to offer. The hostel is spread between two floors of an old 1880s greystone and it has a lot of interesting features and architectural elements. There's a nice terrace where you can relax outside and enjoy the free continental breakfast that is served every morning. The hostel also has a great common room and a shared kitchen that is clean and modern. The kitchen makes it easy for guests to prepare their own meals if they want to save a little money or just enjoy some home cooking. The hostel also has a variety of other amenities available as well such as on-site laundry facilities, free internet access, and free coffee and tea throughout the day. There are thirty beds here in total that are split between six and twelve bed dorms. Both female only and co-ed rooms are available. The dorms are open and relaxed and the beds are comfortable. All guests also have access to security lockers where they can keep their belongings safe and secure. 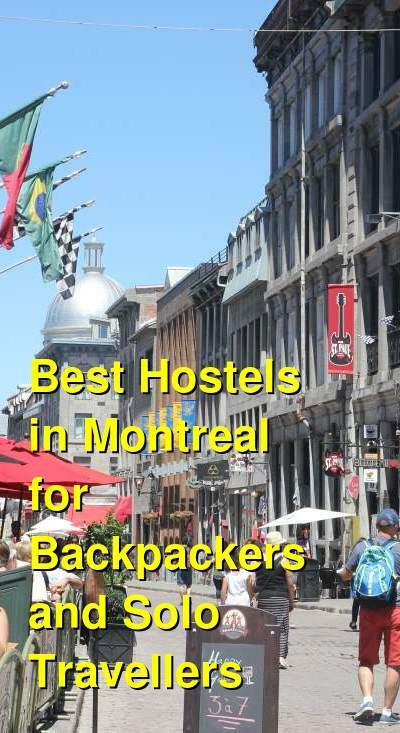 M Montreal is one of the most popular hostels in Montreal. 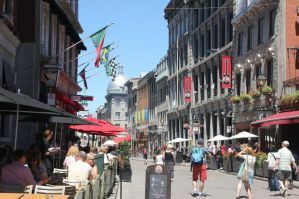 It's conveniently located between Old Montreal and the Latin Quarter, so you don't have to go far to see some of the most interesting parts of the city. It's also less than a minute's walk to St Catherine Street, which is one of the most diverse dining and shopping streets in the city. Whether you're looking for nightlife, dining options, or a great atmosphere, this hostel's location is excellent. The hostel is housed in a building that dates back to 1867. It has a lot of character and it has maintained much of its original architecture and detailed stone masonry. This hostel has both private rooms and dormitories available. Travelers can choose from twin and double private rooms as well as four, six, eight, ten, and sixteen bed dorms. Whatever your budget or travel style, this hostel likely has something to meet your needs. There are also female only and co-ed rooms available. This hostel has a fun atmosphere where it's easy to meet other travelers. If you're traveling alone, or even if you're with friends, it won't be long before you meet some new people.